CROWNED FOR THE 2ND TIME! Every night after dinner Claire and I play a game of pinball. A week or so ago, I changed up my strategy. Usually I try to stack up as many task completions before my multiball (Trolls, Damsel, Peasant, Catapult, Joust) so that I can have some big jackpots going - but lately I have been cashing in the multiball after only one task is completed and with trolls lit. This provides an opportunity to get Master of Trolls, but also gives you four hurry ups when you complete the other tasks. 10 hurry ups is an extra ball, after all! Anyway, tonight I booted up a game, got the extra ball from beating castle multiball and another from royal madness. Then I got the 10 hurry ups one too! After my second Royal Madness, I had all my blue lights lit except for Castle Crusher, and managed to start my second castle multiball. I thought, "Okay, go nuts on the castle!" But the silver balls would not cooperate. A few seconds later, the multiball was over, I had no progress on any shots, and all my extra balls were used up. I decided to go for it. I took like seven or eight EXTREMELY risky shots at the castle gate, and finally got it to open. I lobbed the ball in and Battle for the Kingdom began! Now, I've gotten to this final mode a few times, but for a long while I had no idea what was going on. Then, when I beat the game last year I finally figured it out, so I knew what to do this time. The four balls launched and I started making my shots. I only had the left joust shot left and I still had three balls, but I just couldn't make the shot! The balls kept getting in the way. I sacrificed one ball and let it drain which allowed me enough time to make the shot! The trolls popped up and I had to wail on the gate. Luckily, I had one troll bomb saved up. It cleared the left troll. I was making shots on the castle and I lost one ball. Then I started playing VERY controlled pinball - shooting the castle, catching the ball, repeat. Now there is a 10 second timer between shots (which has screwed me over in past attempts) so my heart leapt up into my throat when the ball got caught behind the right troll. There were only THREE seconds on the clock, so no time to let the ball saver find it. I went berserk and started slapping the right side of the machine, about half way up the cabinet. Luckily I didn't tilt, and the ball drifted out and down to the left flipper where I shot it back up on the fly to hit the gate, buying myself another 10 seconds. I got two more shots in (from the left flipper only) and the gate finally opened up. Claire was watching and I said to her "THIS IS IT. If I hit this shot, I beat the game!" I had done a live catch and had the ball under control on the right flipper. I shot it up, it went along the drawbridge and IN to the castle... ONLY TO ROLL BACK OUT (!!?!???!) It came back to the right flipper, where I dead-bounced it over to the left flipper, which I used to ROCKET the ball up into the castle! Claire and I watched the final animation and she asked "What happens now?" and I told her, "It starts over at the beginning." I launched the ball, flubbed a loop pass off the super skill shot and the ball instantly drained. Game over. 244 Million points. It was funny because last time I beat the game I still had like three extra balls saved up when I started over, and I played for another half hour, wracking up crazy points (377M) and all kinds of extras (11 castles, and 7 each of Damsels, Peasants, Jousts and Catapults). It'll be a while before I ever touch THAT score again! Anyway, last spring my friend Alex Bullet had a 156M game on my machine, so I have been trying to bump his ALX off the high score board, and tonight has brought me one step closer to that goal. He's down to #3. 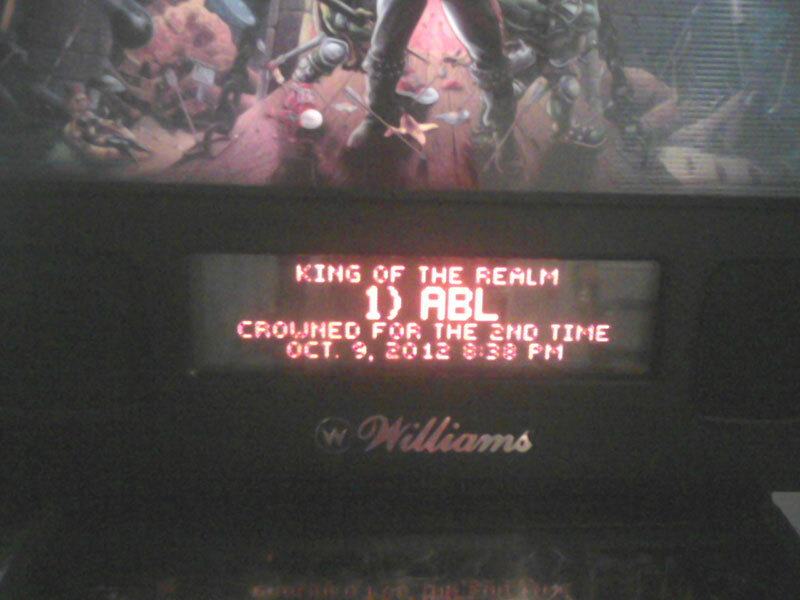 Two more games like this and the entire machine will only have ABL in it!